Home > Find by Parameter > NH4-N - What is ProAm Ammonia? NH4-N - What is ProAm Ammonia? Ammoniacal-nitrogen measurement is an important water quality parameter used to indicate water pollution and the presence of untreated sewage. Ammoniacal-nitrogen may be determined in real-time by on-line instrumentation or by using portable/laboratory water analysis. Instrumentation to continuously determine the ammonium or ammonia concentration is extensively installed at waste-water treatment plants for process and final effluent quality. Analytical measurement is also installed to measure surface water and abstracted water quality, as part of an intake protection system, at potable water treatment plants. Ammoniacal-nitrogen can be determined in several ways but in principle two methodologies predominate; colorimetric and ion selective electrodes (ISE). Colorimetric techniques use a reagent to produce a colour change proportional to concentration which is then photometrically measured but this technique can suffer interference from turbidity and other dissolved species. ISE techniques fall into two categories; direct ammonium determination which is easily installed but has limitations with regards sensitivity, stability and interference and ammonia ISE technology, requiring sample pH adjustment. However, the ammonia gas sensing technique is especially advantageous for waste water applications providing good sensitivity at low concentrations, self-validation of measurement and little interference effect. The Proam ammonia monitor uses an ion selective (gas sensing) methodology which we have optimised, to improve reliability and performance. 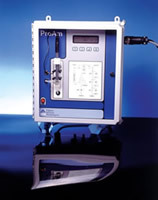 The ProAm is a hybrid of many other designs and uses large diameter tubing and pinch valve technology to internally deliver fluids, to the reaction vessel containing the measurement sensor. The instrument can accept sample containing suspended solids to 100mg/l however we have also developed various sample preparation systems including a membrane panel filter (with optional compressed air cleaning). 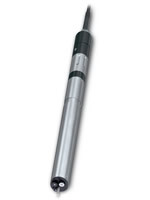 The membrane filter remove suspended solids and biology above 0.45 micron, significantly reducing bio-fouling within the instrument and improving measurement performance. On line continuous measurement of Ammoniacal-Nitrogen for water and waste-water applications without the need to filter sample containing less than 200mg/L suspended solids.